January 1, 2018 turned into the best transit day I’d had yet on the truck. 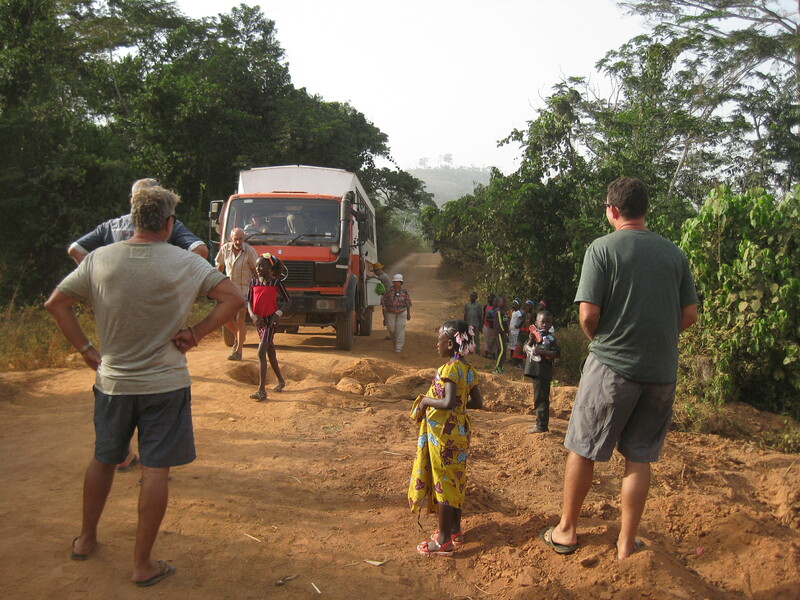 We had been warned that it would be excruciatingly slow going due to the fact that the road from Nzekore to the border with Cote D’Ivoire had taken almost ten hours the last time the truck had made the journey. Lucky for us – the dirt road had been worked on somewhat and although not tarmac’ed yet, we made amazingly good time allowing us to cross the border a day ahead of schedule. 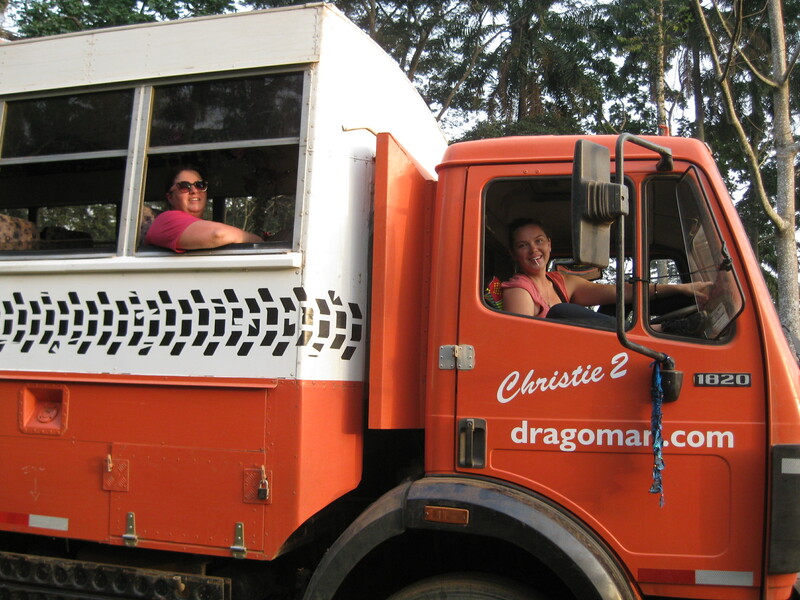 Since this was a very rural border crossing, we were able to use the “Roof seats” on the truck. They are amazing and sitting up there on the top of the truck gives you an incredible vantage point as well as the sense, sometimes, that you’re riding a literal rollercoaster. 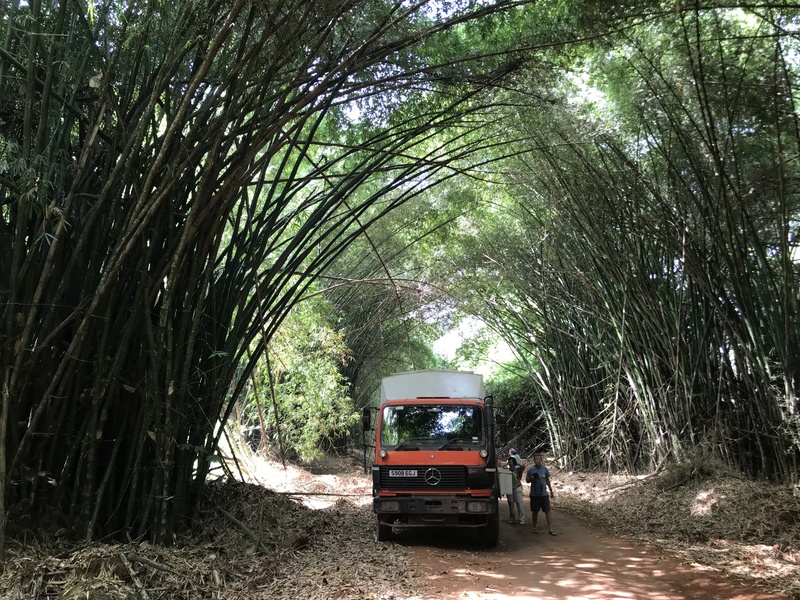 We journeyed through a hauntingly beautiful bamboo forest, and through some really lush tropical forests, interspersed with lively villages where the children and adults inevitably came running out to wave at the truck and us sitting on its roof! That night we bush camped close to a village that Sinead had arranged for us to have a tour of in the morning. The villagers had recently had to move each and every home, being promised 200,000 CFA’s (about $400 USD) per person if they moved to allow for the Chinese construction of the new highway which engulfed their former village. It was sad to learn that so far, the villagers had not received any payment, and whether it was the Chinese construction company or the government that owed them the money was unclear. Another night, another bush camp with village spectators! 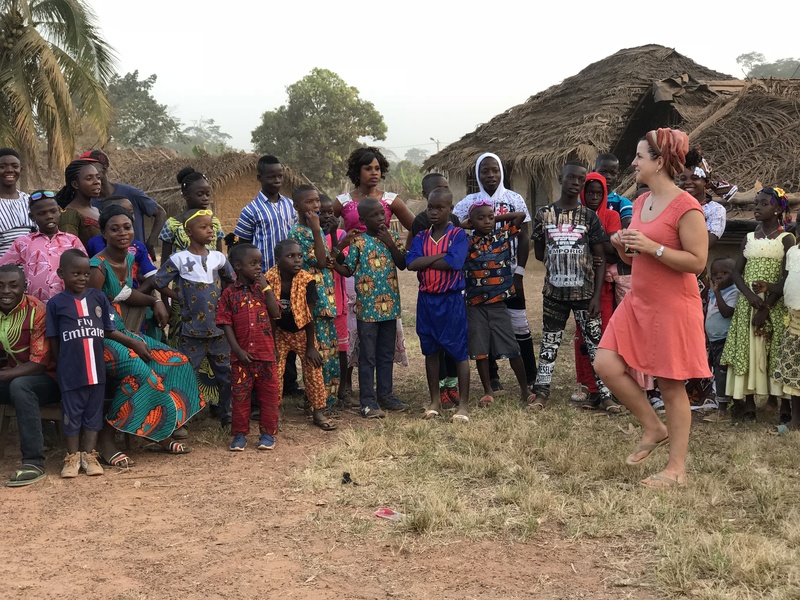 The tour of the village was well worth it and it was a great use of some of the time we had gained by not being stuck getting to Cote D’Ivoire in the first place. We headed to Man (I know…what a strange name for a city, even in a country where they speak French!) and our cook group did some shopping and we all were feigning with excitement at finding a grocery store that had such variety of the foods and goods that had been absent in Guinea. Cote D’Ivoire has turned out to be a gastronomical delight and the meals I’ve had there were the best of the trip (so far!) The supermarket even had fresh brie cheese and red wine for sale – and since I was going to be cooking that night for the group – I couldn’t help but buy a small wedge which I promptly ate on the bus as we continued on in the direction of Korhogo. Before lunch we stopped at the waterfalls outside of man and took a swim. Well, I should say a few of the ladies chose to take a swim and the men stayed dry and watched. I was not about to pass up an opportunity to get the dust and grime off of my body…some people are just far more comfortable being dirty and smelling bad on this trip than me. After our swim we made a potato salad in a field next to a school and ate in the basking hot sunshine. As we headed out of town, I had a scary and shocking moment befall. Sitting in the front row of the truck on the left side, I rolled the window all the way down as the truck got up to full speed to enjoy as stiff a breeze as possible due to the humidity and heat. Since there was no oncoming traffic and we had barely even seen another vehicle these past 24 hours – I luxuriated in the cool sensation of the wind by sticking my left arm fully out of the window and “rode the air” with my hand letting it refresh me. Then, almost immediately after I pulled my arm back into the truck, a bus overtook us, hurtling at breakneck speed from out of nowhere. It was going so fast and so close to the truck that it actually smacked the left hand side mirror to where it snapped back and had to be manually pulled back – luckily it didn’t break. Truck with the open window seat at the front being demo’ed by Jack! For the next few hours, I was rattled just considering what might have happened should I have waited a few more seconds before retracting my beloved and vital appendage. Thoughts of exactly how my arm would have broken, or whether it would have been swiped cleanly off leaving me to bleed out to my inevitable death were hard to put out of my head. In any case, I was very lucky and I have avoided that seat on the truck ever since. Miller, a passenger who had started the trip in Senegal came to me later and said that was the first time he could recall the truck being overtaken like that since the very start of the trip…so he understood my not giving a vehicle coming from behind on the opposite side of the road any weighty consideration. 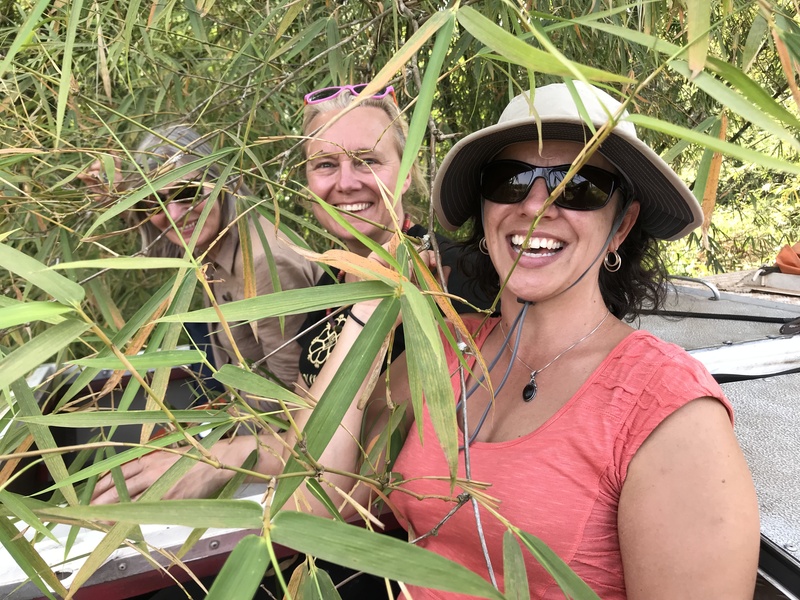 Thankfully the rest of the drive passed without event and we arrived at our second Bush Camp location which was, for once, not within hearable distance of a village – and so we were able to make dinner without onlookers. I shared my red wine with my cook team while we worked away – I was also very excited to make custard from scratch and serve it hot for dessert with chopped bananas. I used to make custard at home as a child, and while it isn’t very popular as a dessert in the States – It really is one of my favorites! It turned out extremely well – smooth, no lumps, and just the right thickness. I think with the Brie, wine and heaps of custard, I had really overdone things and once I’d finished dessert, I immediately abandoned my washing up, running into the tall grass in search of some private place where I might empty out the contents of my belly. Which I did. Another three times. From both ends. Oy vey! And being sick, throwing up and having diarrhea is bad enough in a hotel room – but it is additionally challenging in the bush with no running water. I went to my tent early and laid there, awake, much of the night waiting for further rumblings to attend to. 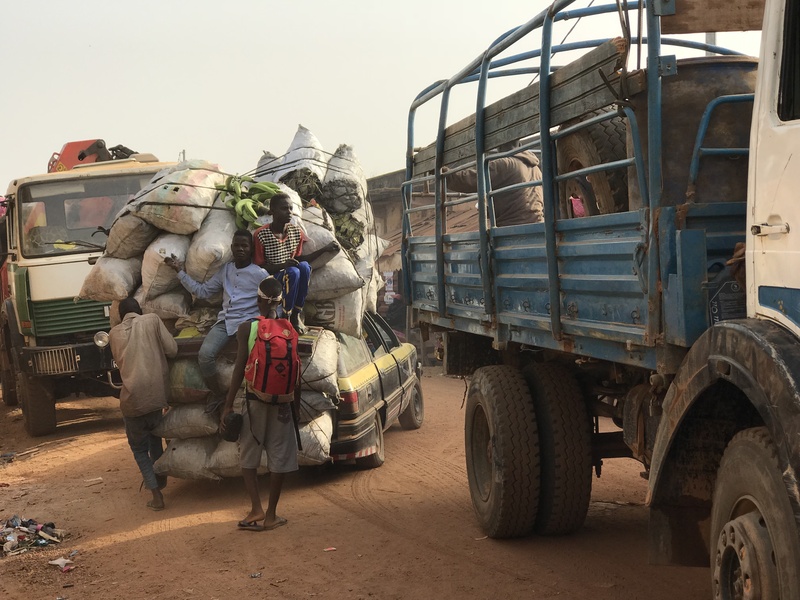 Luckily I felt fine by the morning and we had a long long and quite uneventful day driving all the way to the north to Korhogo – close to the border with Burkina Fasso. Uneventful except for the fact that we got stopped at police checkpoints four times and once had to report to the local police station where Sinead was interrogated about our group’s “Purpose” for being in Cote D’Ivoire. Apparently the road we were journeying on is frequently used to move drugs. 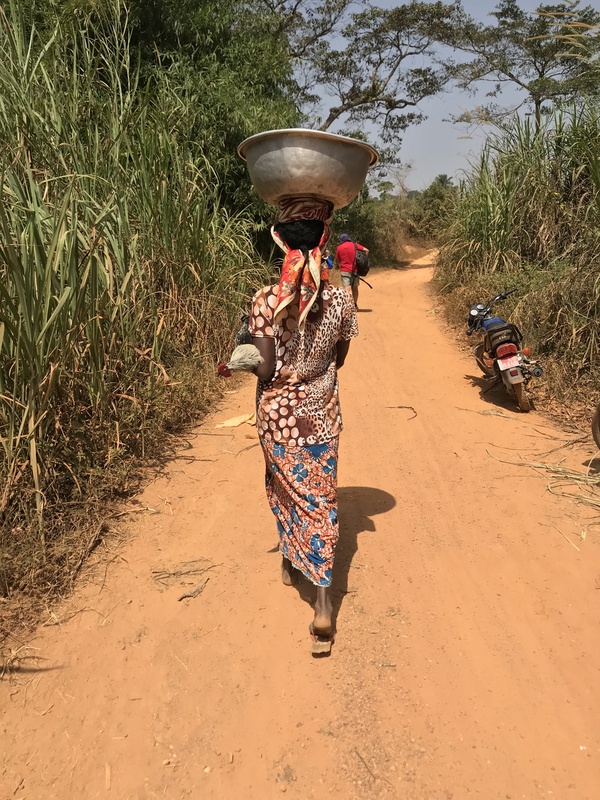 This journey eventually brought us to Korhogo – an important art/textile/handicraft center in Cote D’Ivoire and many of the passengers were very excited to go shopping. Mum and I have both been upset and worried that you almost lost your arm. It just doesn’t bear thinking about. it turned my stomach when i read this post. Thank god you pulled your arm in when you did. Phew! When I said to you the other day about not having asphalt roads, it was this photo you use in this blog that I was referring to — you’re crossing a treacherous bridge. 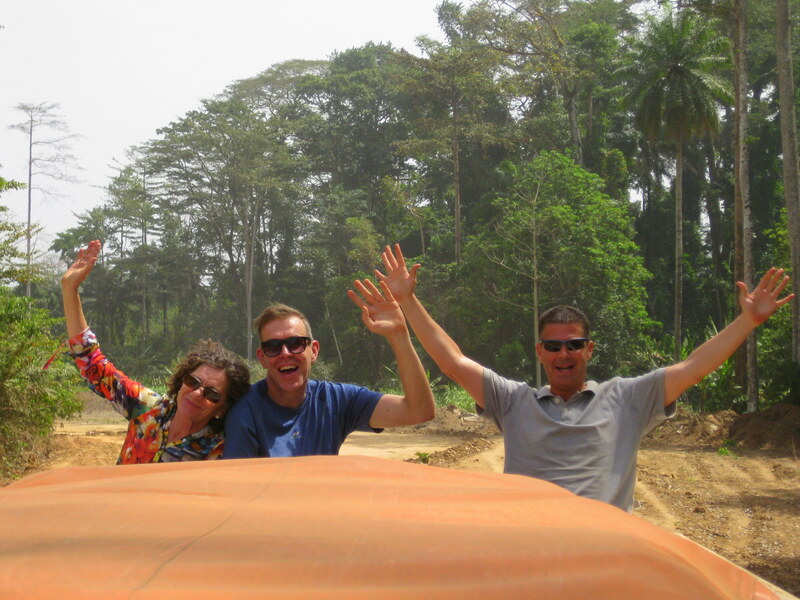 from these photos it seems the roads in Cote D’Ivoire are red dirt roads, which is why I made the comment on Facebook about you having asphalt roads. but anyway…. I can’t imagine being sick and having diarrhoea with no hotel room and no toilet, I realize you’ve been through this before, Machu Pichu comes to mind, but I still think you’re extremely brave and hardy to undertake such trips and go rough. I wouldn’t survive one day. When I read your blogs I think how many tears of anguish and despair I would cry if I was going through 10% of what you experience. 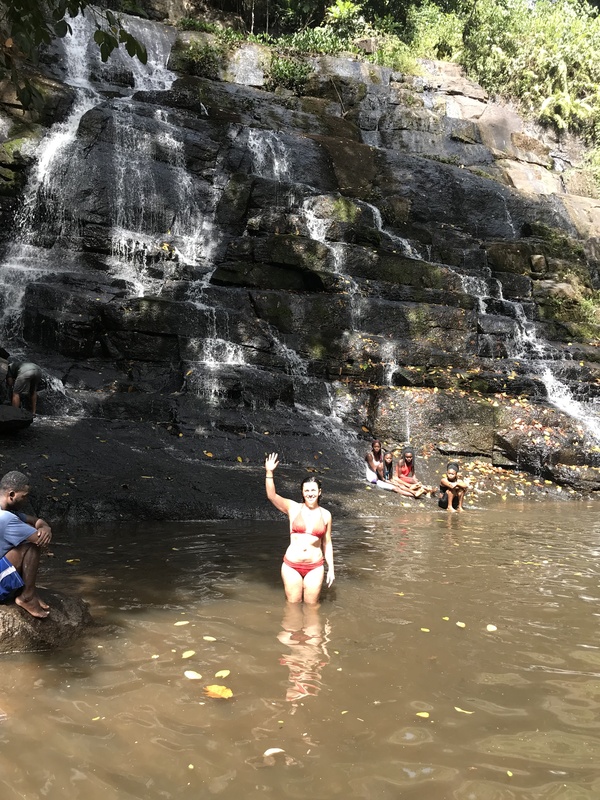 The bamboo forests look pretty and that waterfall looked very inviting and refreshing. Monica…what I am experiencing here is by order of magnitude far easier and cushier than what local people experience each and every day just trying to survive. Each and every westerner should come experience this so that the world could be a more tolerant and grateful place. We take all of our creature comforts for granted and forget that we are the exception and not the rule. And I’m writing this from a minibus that has 20 people inside, 8 goats behind the backseat, 2 people hanging on to the outside and luggage/two motorcycles strapped to the roof.